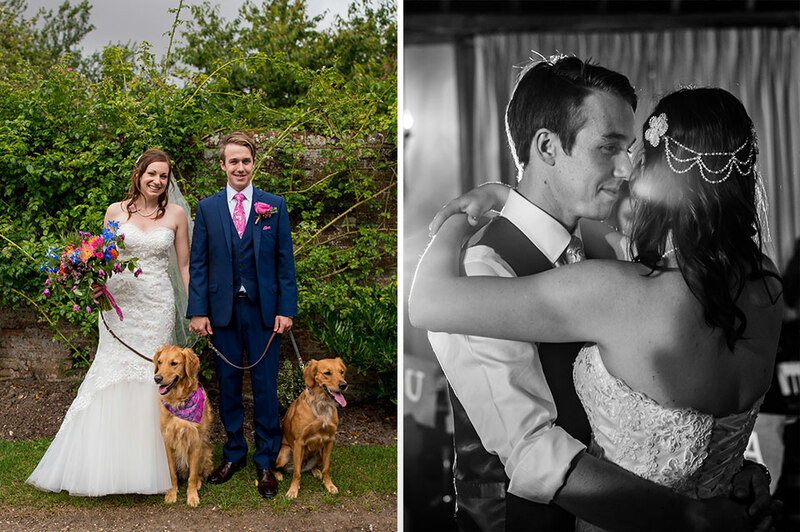 Becca and Michael wanted a wedding day that they could truly enjoy with their friends and family. 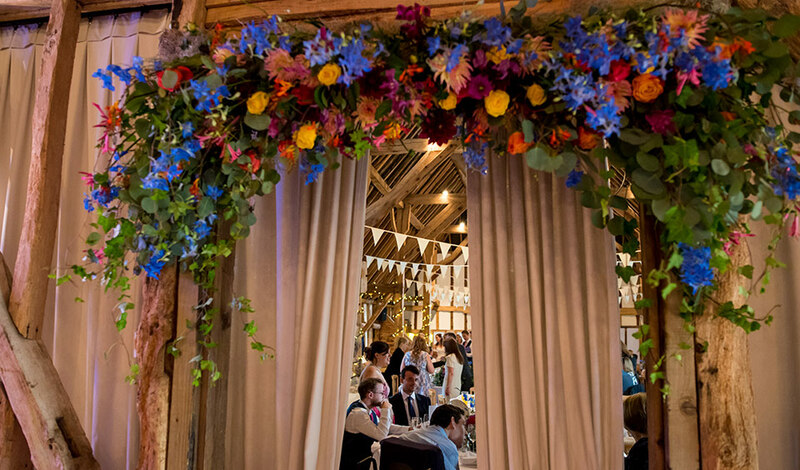 Clock Barn was the ideal location for a relaxed day with great food, plenty of colour and lots of fun. 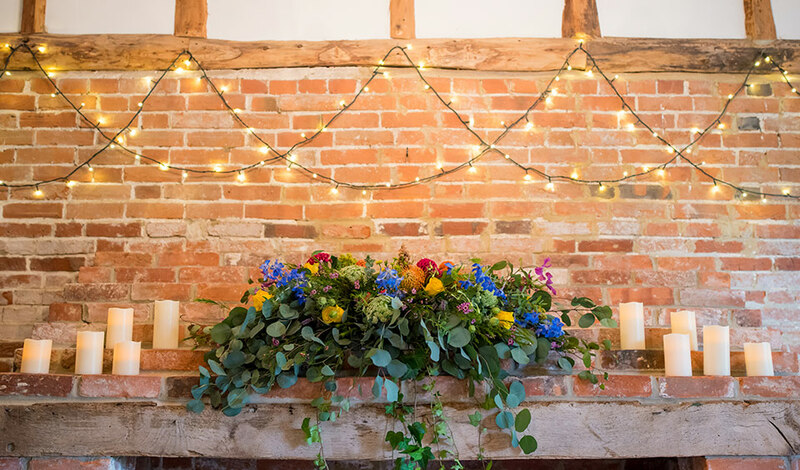 Becca just loves bright colours and happy sunny days so the décor was designed to completely reflect this and create a summery, colourful affair. 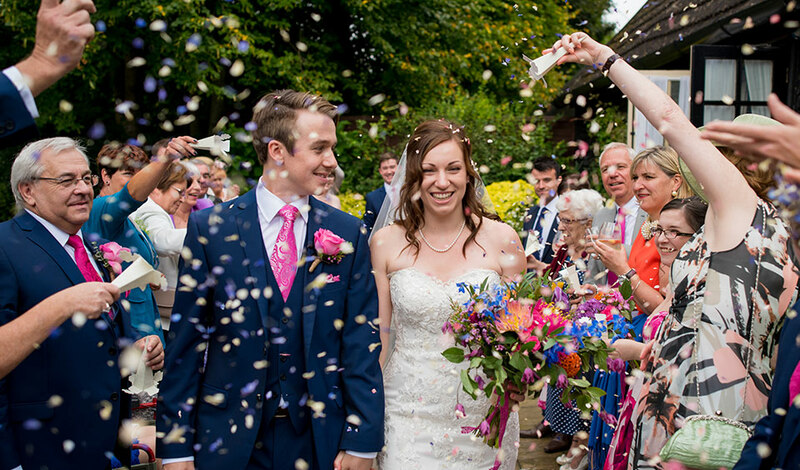 Their elderly neighbour made the beautiful ‘Mr & Mrs Wilkins’ bunting and a family friend provided the amazing flowers. 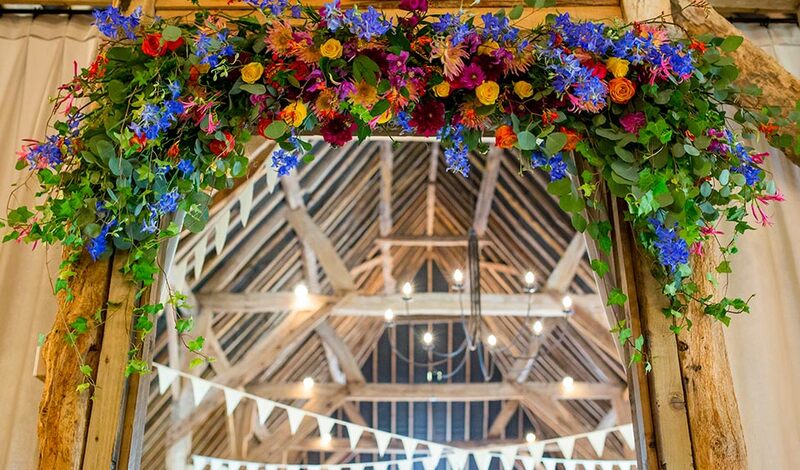 The floral centrepiece that sat above the fireplace during the ceremony became the focal point of the top table for the reception and the flower archway that led into the main barn was absolutely stunning. “Our table plan sat outside the main barn on the easel. 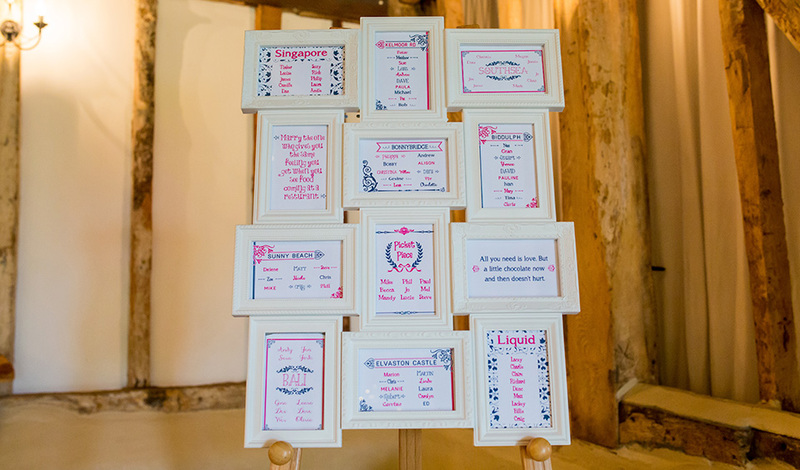 We painted a 10 piece photo frame and then printed each table name and who was sitting on each table. We decided to name the tables after key places in our relationship from the nightclub where we met to the towns we got our dogs from to the place we got engaged right through to the house we had just moved into. The table names on each table had a photo of or from each of those places. It was really fun to do this together and talk about our different key/special places!” – Becca. 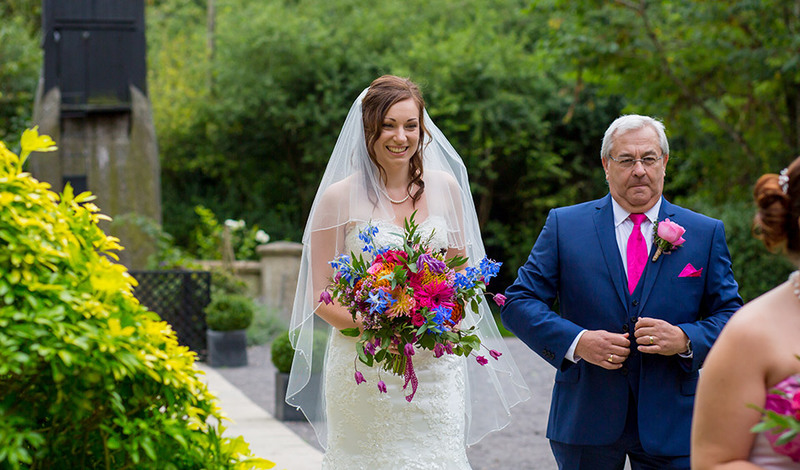 For the ceremony and dinner, Becca wore an Art Couture dress from Elderberry Brides and the high-low hem looked stunning. 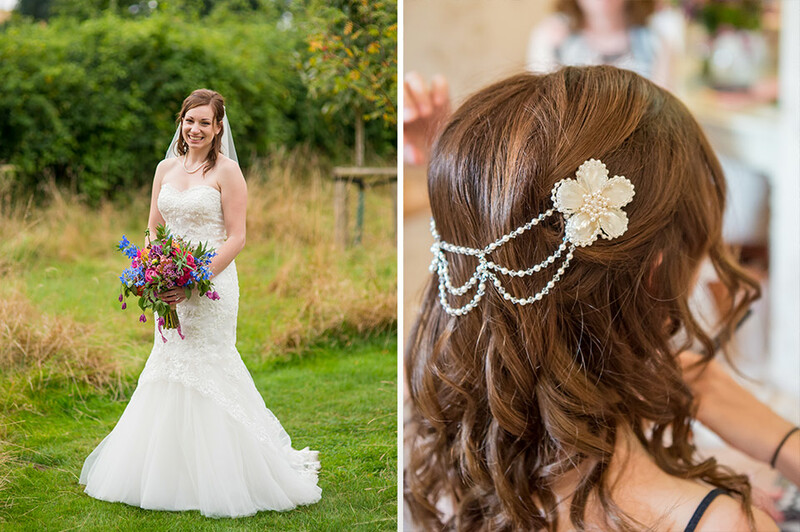 She accessorised her look with diamond drop earrings (a wedding gift from Michael), a pearl necklace and a veil that was a gift from her Nan. Becca also wore super comfortable Rainbow Club shoes and a pearl drop hairpiece by Maggie Lyn Jewellery. 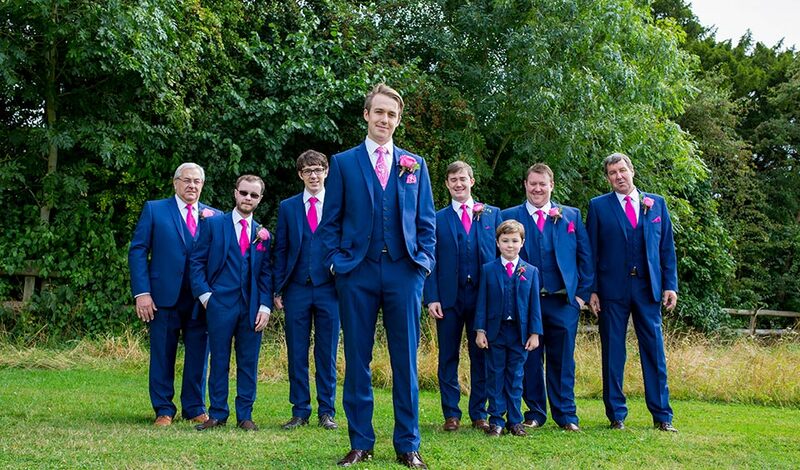 Michael and his groomsmen wore Lounge Lizard suits by Ted Baker hired from Burtons which worked really well, especially as one of the groomsmen only arrived from Australia in the days before the wedding! 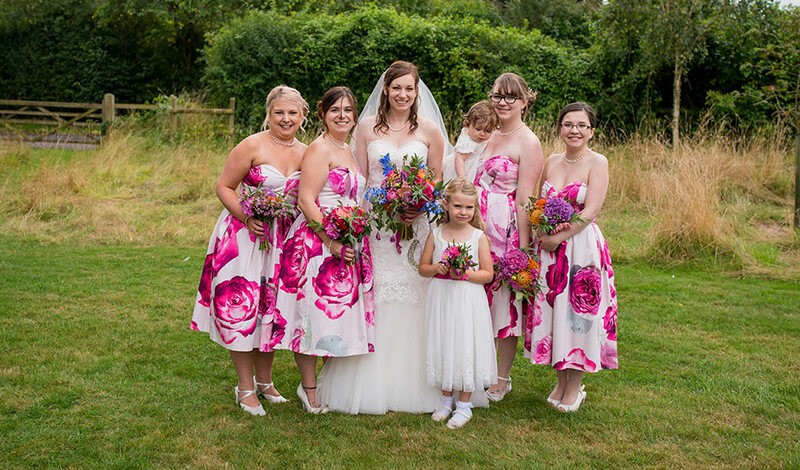 The bridesmaids wore off-white/bright pink floral print tea length dresses and Becca gifted her maids a pearl necklace, droplet earrings and hair slides to wear, all made by Maggie Lyn Jewellery. 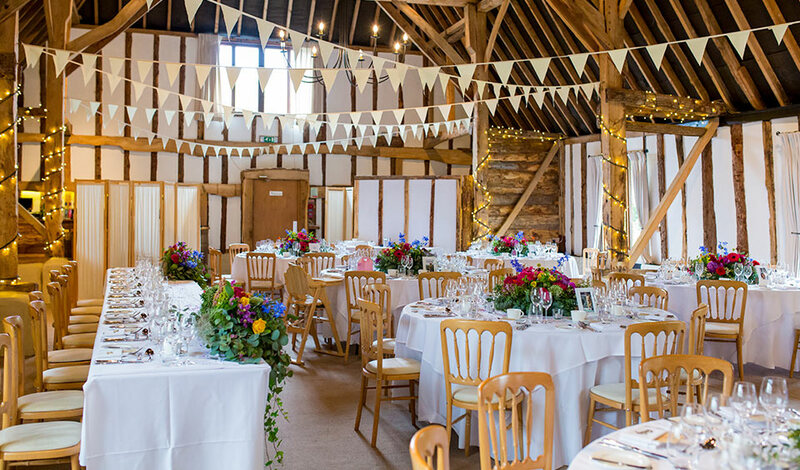 After the ceremony in the Stable Room, the newlyweds and their guests enjoyed canapés outside the barn along with White Peach Sangria, a beer drum and mango mocktails. 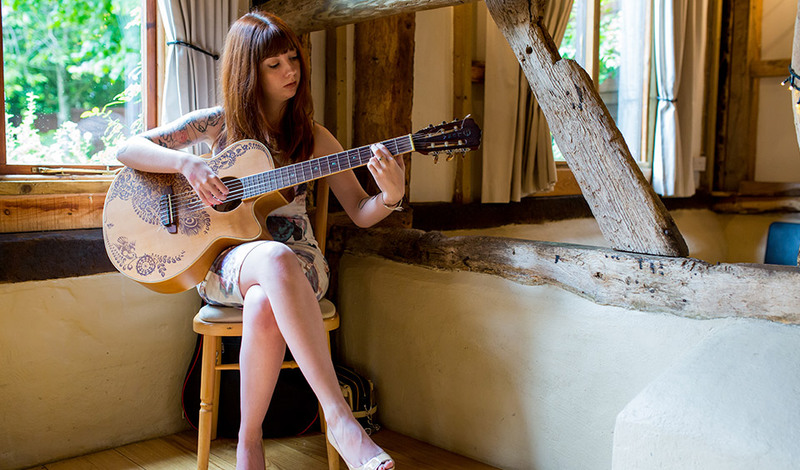 A friend played acoustic guitar and a caricaturist, Rich from Warble Entertainment, was another great addition, entertaining guests into the evening. “Following the amazing food Tasting Event we were very excited about the menu!! We chose the ox cheek ravioli to start, sundried tomato and goats cheese stuffed chicken with dauphinoise potatoes for main and then a trio of puddings – cheesecake, chocolate brownie and treacle sponge with an orange spiced sauce, which is something I would have never chosen but after having at the food tasting it was delicious. We also had a surprise course, inspired from the food tasting, which was lemon sorbet with lime and gin.” – Becca. For guests who were feeling hungry after all that dancing, there was an evening BBQ and, of course, cake. 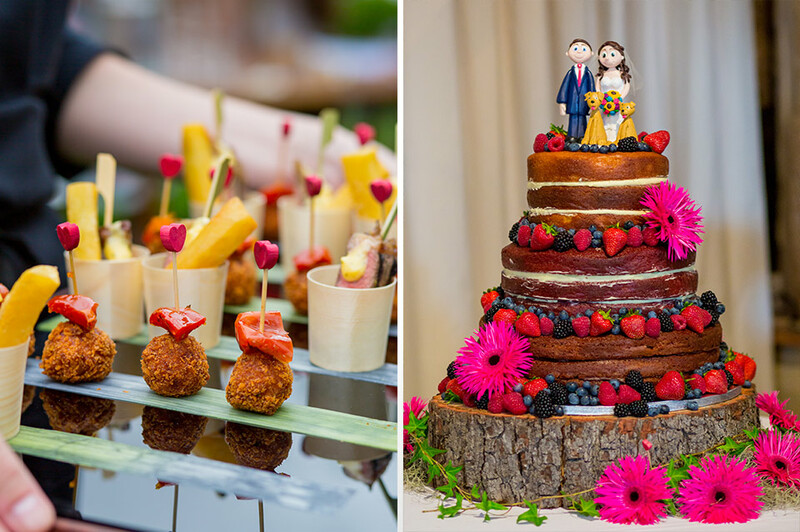 Becca’s sister made the three-tier naked cake that also featured a personalised cake topper from Loulabelles Occasions that included the couple’s dogs! 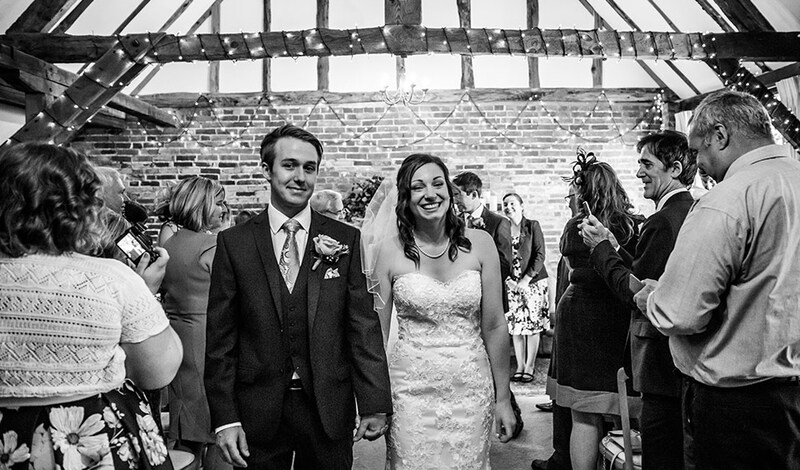 Clock Barn is one of the most versatile wedding venues in Hampshire, so if you want to see how good it can look with a totally different wedding style, just take a look at Larissa and Sam’s Spring Wedding. You won’t regret it!